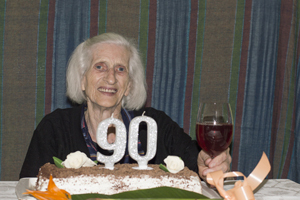 I am planning a surprise 90th birthday party for my mother-in-law. We are having a champagne brunch for approximately 60 people. Relatives she hasn't seen in over 20 years are flying in from the West coast, and everyone from her hairdresser to her Doctor (who has gotten her to age 90) is coming. What makes it really special is that she was a teacher until 30 years ago and I have tracked down some of her favorite pupils, her old principal, and some of her old teacher friends. We will have a pianist playing during the brunch and a charachaturist going from table to table as a treat for the guests. I have also hired a photographer to do a family portrait as a birthday present for her, since the entire family will be under one roof together for the first time in several years.